Do you care about your skin? Of course you do. So don’t just leave it vulnerable to the wearing conditions of winter. Take action to safeguard your skin against harm. Your skin protects you from the outside world, so you need to return the favor. 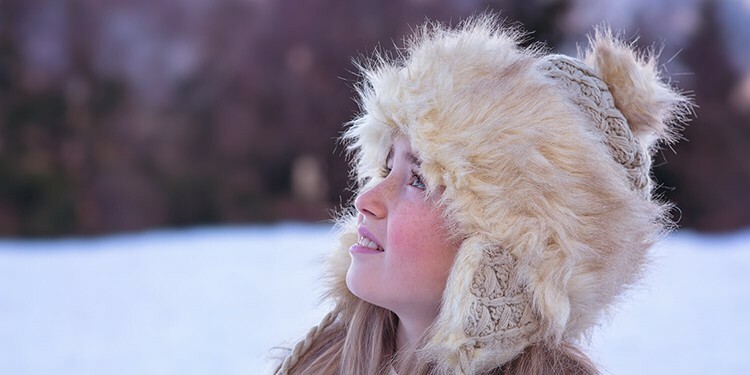 In this article, we look at 5 ways to prevent your skin from getting dry or chapped during the coldest time of the year, seeing how simply planning ahead can save you a lot of discomfort. Let’s face it: winter may be a beautiful time when it comes to lighting, artisanal coffees, gifts, snuggly clothing, and the occasional enchanting sheet of snow (region permitting), but it’s a nightmare for your skin. If you’re heading out for a stroll around town with the temperature plummeting and an icy wind buffeting you in every direction, you’re in for a bad time. Your lips: cracked and sore beyond belief. Your cheeks: flushed and blotchy. Your mood: increasingly sour. Once the frost gets a hold of your skin, it’s tough to get it under control, leading to the worrying prospect of spending the first blushes of next spring just trying to feel genuinely comfortable again. OK, even if you’re a dedicated athlete spending hours every day working out in the harsh outdoors, you’re still going to be spending the majority of your time indoors — and that may sound like a good thing for protecting your skin during winter (keeping it out of the cold, of course), but there’s a snag: humidity. When it gets cold, the air molecules pack together more densely, leaving less room for water particles to form. This drop in humidity has a negative effect on the moisture of your skin, leading it to dry out more rapidly. And if you warm up the air inside your home, it will make the environment more uncomfortable, but it won’t raise the humidity in the process. This is because the air outside — the air you’re drawing in to heat — lacks humidity, and simply making it hotter won’t automatically produce water particles. Spending time in warm air with low humidity will be much less unpleasant than being outside, but your skin will still dry out far more easily that it would in a humid environment. To address this, consider getting a humidifier. You need only fill up the container with water and activate it: over time, it will steadily introduce more water particles into the air, raising the humidity level and helping your skin retain its moisture. When there’s a chill in the air and you’re keeping movement to a minimum, you don’t necessarily feel that you need to be taking in a lot of water. It’s not as though you’re sweating a lot — even if you have thick layers on, you’re probably cool enough. But hydration is just as important during winter as it is during any other season, and it matters just as much to your skin. After all, even if you are barely sweating, your skin will still be losing moisture to the air due to the low humidity. And then there’s your general health: the less hydrated you are, the less effectively all your systems will work, making you more vulnerable to suffering a wide variety of skin conditions ranging from annoying to brutal. Does this mean you need to be drinking 8 cups of water every day? Well, no, it doesn’t. Just aim to drink at least slightly more water than your thirst level demands, and remember to make it warm — or at least room-temperature — whenever possible so you don’t end up cooling your body down (your body has to warm up cold water to absorb it, and it uses water to do so, making it an inefficient way of staying hydrated). If you don’t really like drinking water by itself, add something to it: some kind of chocolate mix, or your favorite kind of fruit syrup. Prepare a flask to take with you whenever you’re going to be out of the house for a while, and you should have no problems staying topped up. When you’ve been indoors for a while, the crisp winter air can feel extremely refreshing, but there are two problems with that idea: firstly, it won’t last very long, and secondly, it’ll risk the health of your skin. It’s much safer to avoid exposing your skin to the cold and dry air whenever possible — you don’t need to wear a hazmat suit, but take sensible precautions. Practically, this means the following: warm and snug gloves, a large and toasty scarf (that won’t fall off during a light breeze), the biggest and comfiest hat you can find, and maybe even goggles if you like the aesthetic and you don’t mind some overkill (or you’re going to be cycling for some reason). Do the layers matter? For overall warmth, yes, but not so much for your skin. In fact, the more layers you wear, the more friction there will be, and the more likely you’ll be to irritate your skin, so stop putting more layers on once you reach a comfortable temperature (also, if you go too far and get hot, you’ll start sweating and lose skin moisture very rapidly). Oh, and be sure to avoid any fabrics that are likely to cause irritation, because the itchiness will inevitably drive you to expose skin in order to scratch it. Something made from cotton or wool might be extremely warm, but it isn’t going to be worth the risk. Microscopic glands in your skin — called sebaceous glands — secrete an oily substance called sebum. Sebum plays a very important role in protecting the health of your skin, waterproofing it to not only prevent water from getting in but also prevent moisture from being lost to the air. In winter, the problem with sebum is that people tend to wash more frequently. They want to stay warm, cheer themselves up, and rid themselves of the discomfort that often results from wearing very thick layers for hours on end — and when you spend 30 minutes in a steaming-hot bath, a lot of that sebum will be washed away with the grime. As a result, while your skin will definitely be more moisturized immediately after your bath, that moisture (and more beyond it) will probably be lost to their air because your skin no longer has the sebum to keep it locked in. This means that particularly-hot showers and baths are actually counterproductive when you’re trying to protect your skin. To keep your natural skin oils, be careful with your bathing. Avoid strong substances such as shower gels unless you’re absolutely sure that they won’t dry out your skin, and cut down on both the time you spend in the shower (or bath) and how hot you have the water. Knock the temperature down and you’ll ultimately be glad you did. Once you’re done with washing (being careful to preserve your natural skin oils as much as possible), there’s one more thing you should do that will have a big impact: moisturize. You may already moisturize sometimes, but in winter you should make it a regular habit due to how incredibly effectively it prevents chapped skin. After washing, give your skin a few minutes to dry off a little, then apply your favorite moisturizing cream to any area that’s giving you particular trouble, and any area that’s likely to be exposed to the elements (your face, for instance). When it’s soaked in nicely, you can get dressed and continue with your day, knowing that you have some measure of protection. Be careful not to apply too much, though! Anything beyond a certain point won’t give you any further protection, and you really don’t want to get home after a long day to discover that excessive moisturizer has left gigantic stains inside your clothes. Use just enough to cover the area nicely, and if you’ve used too much, gently wipe it off. If you follow each one of these tips — and you should, because they’re fairly cheap and easy — then your skin will thank you. You’ll make it through the coldest part of the year with your skin intact, and you can head directly into enjoying the advent of spring. Good luck! 2018 Womensedge.org. All rights reserved.